Using a shop-bought flan case saves heaps of time so you can concentrate on making the presentation really stunning. Place a 20-25cm/8-10in stainless steel ring onto the flan case and use it to cut through, discarding the outer rim of sponge. Cut the flan in half horizontally so you end up with two thin layers. Place the steel ring onto a large, flat serving plate. Place one of the sponge layers inside and press down lightly. Sprinkle half the Drambuie over the sponge then set aside. Place the double cream in a bowl with the vanilla bean paste, the remaining Drambuie and the caster sugar. Whip until semi-firm peaks form when the whisk is removed. Line the ring with the large strawberry halves, placing the cut-side against the ring – reserve the rest of the strawberries. 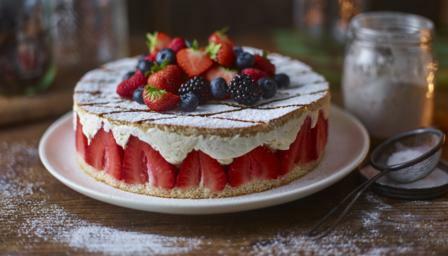 Carefully spoon the whipped cream into the centre of the flan and spread out gently to fill the whole mould – adding as much cream as necessary to cover to the top of the strawberries. Place the remaining flan case on top and press down lightly. Remove the ring by carefully warming the edges with a hot cloth and lifting it straight upwards. Dust the top of the gâteau with the icing sugar. Carefully heat a metal skewer over a direct flame until very hot (use oven gloves). Use the hot skewer to score the top of the cake with lines to create a diamond pattern. For the spun sugar, if using, place the remaining caster sugar into a very clean frying pan and place on the stove to caramelise. Once it is caramelised remove from the heat to cool slightly. Dip a small spoon into the caramelised sugar and twist around a steel to create curls which will decorate the top of the gâteau. Pile the remaining strawberries and berries on top of the cake. Garnish with sprigs of mint and the caramel curls. Serve cut into wedges with pouring cream if desired.